Abellio Greater Anglia is a UK Train Operating Company that operates rail services from London Liverpool Street in the city of London to the Northern and Eastern areas of greater London as well as the East of England. Abellio Greater Anglia operates local, suburban and express services from London Liverpool Street in the City to east and north London, Essex, Hertfordshire, Cambridgeshire and East Anglia. Greater Anglia is owned by the Dutch Company Abellio. It began operating in February 2012 and took over the franchise formerly held by National Express East Anglia. Greater Anglia's rail services run from London Liverpool Street station, in the heart of the city. London services may also call at Stratford (London) serving the Olympic Park, thiswill provide excellent connections for those in the South East area during the 2012 London Games. 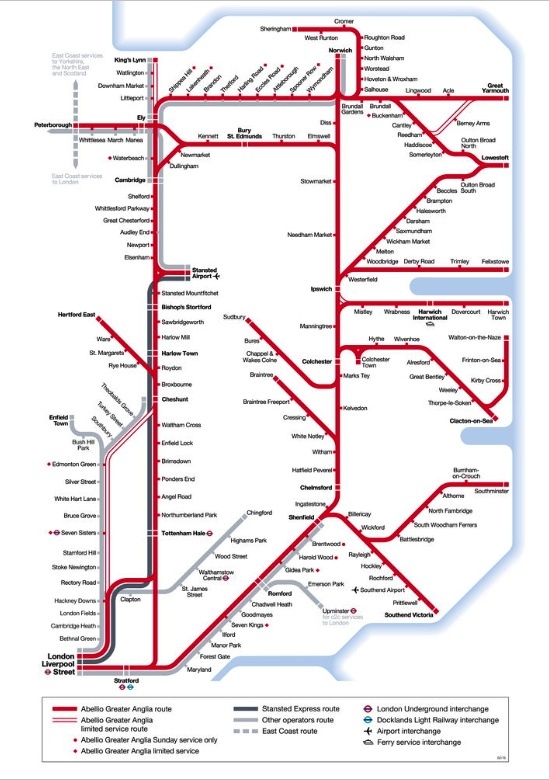 Greater Anglia runs services to many main line stations including: Shenfield, Colchester rail stations, Norwich, Ipswich, Southend rail stations, Clacton-on-Sea, Stansted Airport and Peterborough. Greater Anglia also provides train services to Harwich International - providing excellent rail links to travel on to the Hook of Holland via the ferry. The Dutch Flyer is a combination rail sail package from any station on the Abellio Greater Anglia network to the Hook of Holland. With great rail connections for onward travel to the rest of the Netherlands; including The Hague and Rotterdam in 1 hour and Amsterdam in 1 hour 30 minutes.